Welcome to the most referred, and reputable paintless dent repair company in Houston Texas. As you may have heard paintless dent removal is the fastest, highest quality process for removing dings and dents form your vehicle without painting. Paintless dent repair or commonly called PDR is an extremely specialized process that utilizes surgically fabricated tools designed to gain access behind the damaged panel. At Dent Lion we pride ourselves on offering the best paintless dent repair and mobile dent repair service in Houston and the surrounding area. It’s often we are the perfectionist so you don’t have to be one. Our team of professional technicians specialize in paintless dent repair, and hail damage repair. We have earned a great reputation for our convenient on time service, and taking the time to do the job right. Paintless Dent Repair (PDR) is the art of removing dents and typical door dings. PDR works from behind the vehicle damage, there is no sanding, painting or body fillers necessary. Our paintless dent repair Houston specialists will gain access to the inside skin of the metal and apply gentle pressure. Knowing where to apply that pressure allows for the removal of the vehicles dent. Our Paintless dent repair Houston services are completely mobile. Mobile dent repair service means we come to your location and repair, restore and renew your vehicle on site. All our repair services – dent repair, door dings, and hail damage – offer a lifetime warranty for as long as you own your vehicle. The King of Dent Repair. Call us today at 832-579-5541. We will come to you! 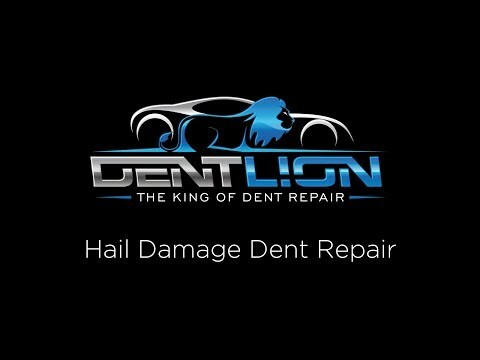 Dent Lion knows how to fix a dent in a car. Being Houston’s top-rated and referred Paintless dent removal company. We work diligently to make sure there is no trace of any ding left. Fixing dents may seem like a simple task but in reality can be very difficult. The time, patience and experience of technicians like ours at Dent Lion is a must for the proper auto dent removal. Using state of the art tools and techniques keeps us ahead of the competition. At Dent Lion, we know the quality is number one. Not all dent repair technicians are the same. While some clients may be looking for the lowest price, remember that cheaper isn’t always better. If the dent removal isn’t done to a high standard then you will be no better off than before the repair. You can also end up with paint scaring that cannot be repaired, and that defeats the purpose. 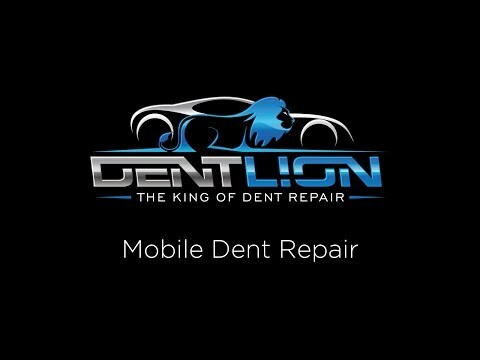 Dent Lion will be there to help with your dent repair needs. Small dents are a nuisance for car lovers. Unsightly, they will make a beautiful vehicle into an into an ugly one if repaired or not repaired properly. Leaving pock marks or cracked paint where an inexperienced or uncaring technician “fixed” your small dent. 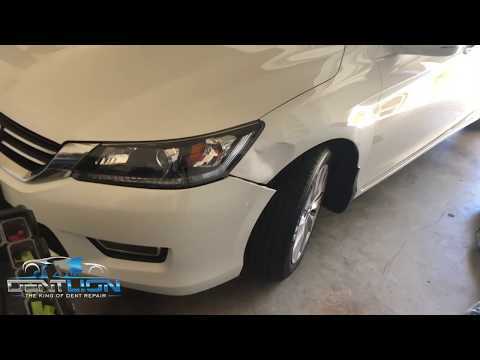 When you choose Dent Lions Mobile paintless dent repair service you can be confident the person working on your vehicle is looking to repair that small dent to perfection. Large dents are a bummer and everyone can see them at a glance. Taking the pride and joy out of driving your car around. Luckily we know how to get those dents out of your car in a timely manner and at a reasonable price. We love working on larger dents and take pride in the final product. Watching our clients amazement when they see how we repaired the vehicle to such a high standard. Knowing how to repair small hail dents and large ones, we can put your vehicle back to pre-storm condition. Paintless dent repair is THE best method to repair auto hail dents. Having a hail damage repaired using conventional body shop repair methods will leave you vehicle will loads of body filler, paint match issues, and a lower resale value. Our methods prevent all of these negatives. If you would like to know the cost of your dent repair text, email or message us a photo. We will respond within 30 minutes. Our fast response sets us apart from our competition. You will not have problems contacting us. We take client service seriously! Don’t waste your money on gimmick “pop a dent” tools you see on TV or the internet. Products that say they can pop a dent out of your car simply don’t work. They may make the dent change shape and look different, but the dent will still be there. Dry ice is another myth do it yourself repair method. Freezing your vehicles paint and the causing it to flex is a bad idea. It will most assuredly cause a crack in your vehicle finish. Using a suction cup is also not going to work in the event the dent does move it will likely become multiple smaller dents, or be overextended and stretching the metal. This can cause additional costs to repair. As it will be harder to fix a dent if not properly repaired from the beginning. Dent Lion offers mobile dent repair service to Houston and the surrounding so chances are we offer dent repair near you. Our focus is making your repair experience as fast and easy as possible. We will come to your home or office to perform your dent repair. Making you dent repair simple and convenient. The cost of auto dent repair can vary depending on the factors mentioned above. Also, things like body lines can directly affect the cost of repair. Our method of repairing a car dent even with these factors is still cheap compared to a conventional body shop repair. We also use no paints or fillers. Keeping your vehicles original parts, value, and warranty intact. Others kitchen and outdoor patio appliances. So if your stainless appliance needs or service give us a call. We can make those annoying blemishes disappear.